This becomes an important question when you start thinking about the cost of peptide synthesis. The price of many amino acids has come down significantly over the years, but there are still some amino acids that are exorbitantly expensive (think isotopically labeled amino acids). In order to minimize the overall cost of a synthetic peptide, it is critical to ensure that the peptide is successfully synthesized in a single attempt. To address this question, I chose to synthesize Helix A, an 18 amino acid amphipathic helical peptide. This peptide is of reasonable length yet contains evenly dispersed hydrophobic and hydrophilic amino acids making synthesis relatively straightforward. I synthesized the peptide three times varying the number of amino acid equivalents, but keeping the scale, coupling reagents and reaction temperature and time consistent. So to start, I did the thing that no peptide chemist wants to do. I prepared Helix A using 1 equivalent of amino acid. Using my Initiator+ Alstra™ peptide synthesizer, I chose DIC and oxyma as my coupling reagents and each amino acid was allowed to react for 5 minutes at 75C. As many of you would expect, this synthesis totally failed, Figure 1. 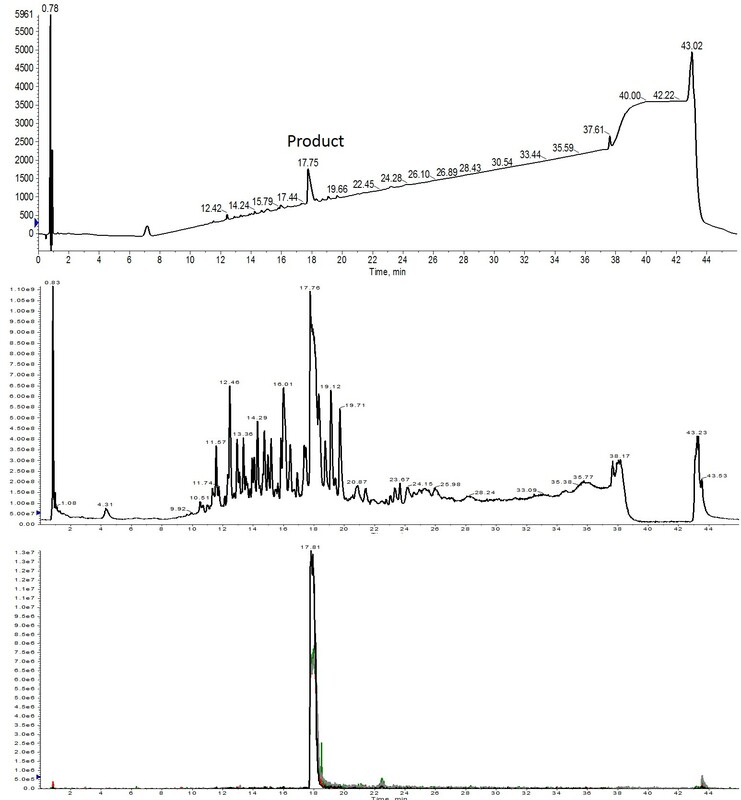 Figure 1: Crude analytical HPLC-MS chromatography for Helix A synthesized using 1 equivalent of amino acid. 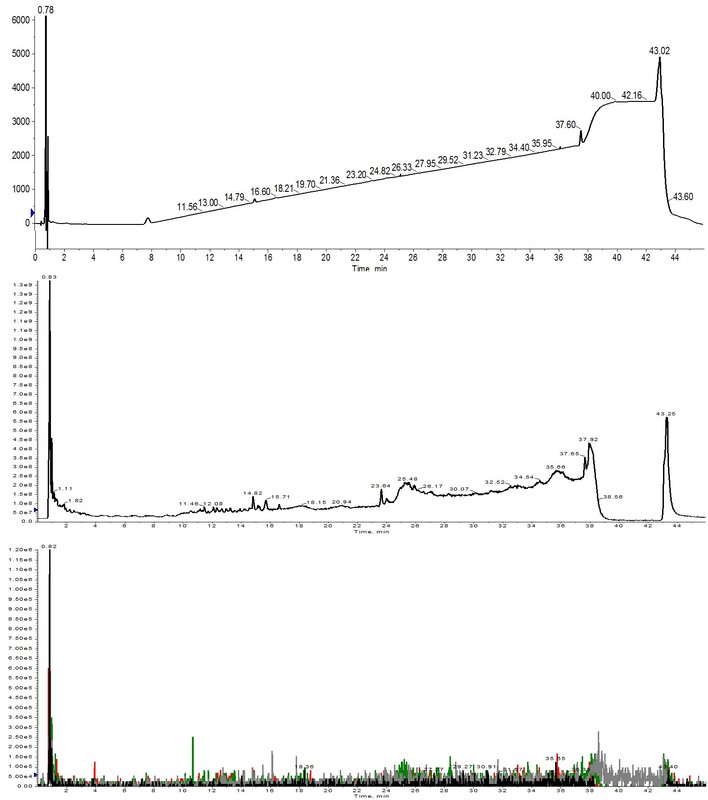 No peptide was identified in the UV absorbance trace (top), the total ion count (middle) or even when search for specific ions within the TIC (bottom). Extracted ions evaluated were 1113 (m+2, black), 742 (m+3, red), 557 (m+4, green) and 445 (m+5, grey). There are no peaks in the UV and very few peaks even in the mass TIC. When I attempted an ion extraction, the desired peptide charge states could not be identified. There are most likely a couple of things at play here. First and foremost is the fact that the amino acids are used in equimolar quantities. This demands that every single molecule be consumed in the coupling reaction for the synthesis to be successful. The probability of this actually occurring is small. As second factor to consider is concentration. Both the amino acid and DIC solutions were diluted by half to 0.1 M in order to achieve the minimal liquid volume in the reactor vial for efficient and even heating. Diluting the samples further decreases the probability that the amino acid will productively interact with the coupling reagents in solution and then the activated amino acid interacting with the amino terminus of the growing peptide chain. This result highlights why we use superstoichiometric equivalents of amino acid relative to the resin loading. In the second synthesis, I increased the number of amino acid equivalents to 2 and brought the amino acid and DIC concentration up to their normal 0.2 M concentration. This synthesis did yield peptide product, although not the desired peptide product, Figure 2. Figure 2: Crude analytical HPLC-MS chromatograms of Helix A synthesized using 2 equivalents of amino acid. No peptide product is observed in the UV spectrum (top). Very small amounts are evident in the total ion count (middle) and which is further verified with the extracted ion chromatogram (bottom). Extracted ions evaluated were 1113 (m+2, black), 742 (m+3, red), 557 (m+4, green) and 445 (m+5, grey). Increasing the number of equivalents did provide a modest improvement as you would expect. Unfortunately, very little of the desired peptide was identified in the solution, Figure 2, bottom. I was able to identify several masses that correspond to peptides with 7, 9, and 13 amino acids (14.65 and 15.53 min retention time respectively), giving me hope that the next increase could yield my desired full length peptide. For my third synthesis, I increased my amino acid equivalents to 3, keeping the concentration at 0.2M just like the previous synthesis. Finally, I was able to identify my desired peptide product in the mass spectrum and even more satisfying is the fact that the desired peptide is in fact the majority product by UV, Figure 3. 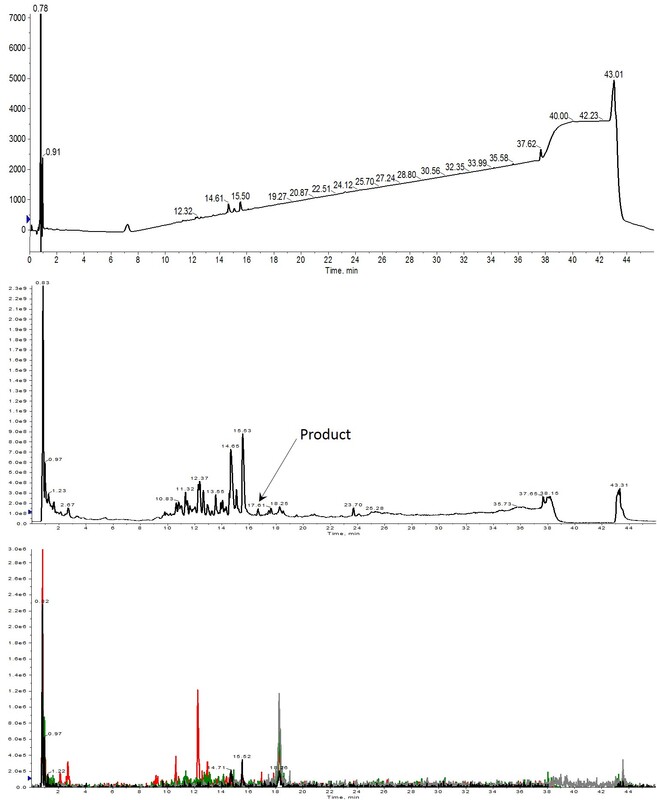 Figure 3: Crude analytical HPLC-MS analysis of Helix A synthesized using 3 equivalents of amino acid. The desired product is present as the main peak in the UV spectrum (top) and is also the most abundant ion present in the total ion count spectrum (middle). All four charge states are abundant and overlap when extracted from the total ion chromatogram (bottom). Extracted ions evaluated were 1113 (m+2, black), 742 (m+3, red), 557 (m+4, green) and 445 (m+5, grey). The UV trace suggests that purification of this peptide will be relatively straightforward, further supporting the observation that 3 equivalents of amino acid are necessary to ensure high yielding, relatively clean crude peptide product without the need for significant coupling reaction optimization. While you could certainly improve the overall yield and potentially increase the overall purity of the sample by increasing the number of equivalents, you can certainly reduce your overall cost of synthesis by reducing the number of equivalents as I have demonstrated above. Please remember this is a peptide of somewhat average length, these conclusion will likely not hold for peptides of significant length. How many equivalents do you like to use for your microwave assisted peptide synthesis?